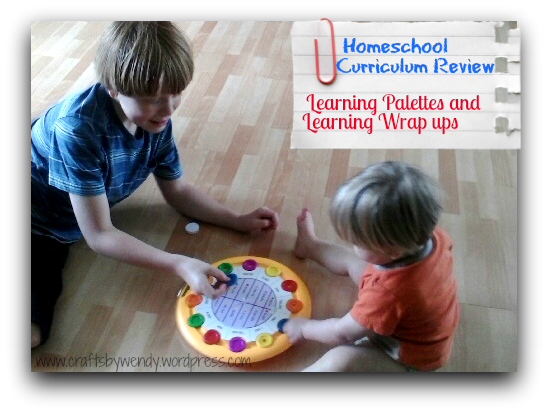 So, what is a Learning Wrap up, anyway? 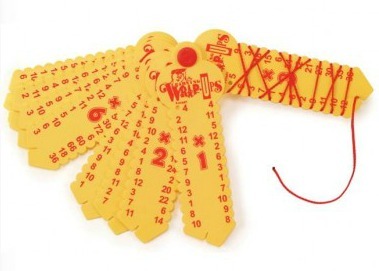 Put simply, it is a set of 10 “keys,” connected together with an attached string (not attached with the string, but the string is also attached). The child separates the one they’re working on – they don’t come apart, but you rotate one to work with and hold the others together out of the way – and wraps the string around the key. There’s a list of numbers down each side and the math family (+1, x5, etc) in the middle. The goal is to take the numbers on the left (in top-to-bottom order), add, subtract, multiply, or divide by the family they’re working on, and match them to the correct answer on the right. Each key is self-correcting; there is a raised pattern on the back, and if all the answers are correct, the string will cover those lines. The ultimate goal of the Learning Wrap ups is that the student will learn the facts and be able to complete each “key” in 30 seconds or less. They come in an incredibly wide variety of topics and problems. The math set that we received includes addition, subtraction, multiplication, division, and fractions. The Vocabulary set we got includes synonyms, antonyms, homonyms, and compound words. In addition to all of these, there are Wrap ups for ESL (English as a Second Language), Geography, Spanish, Music Theory, Science, Advanced Math, and Preschool subjects. 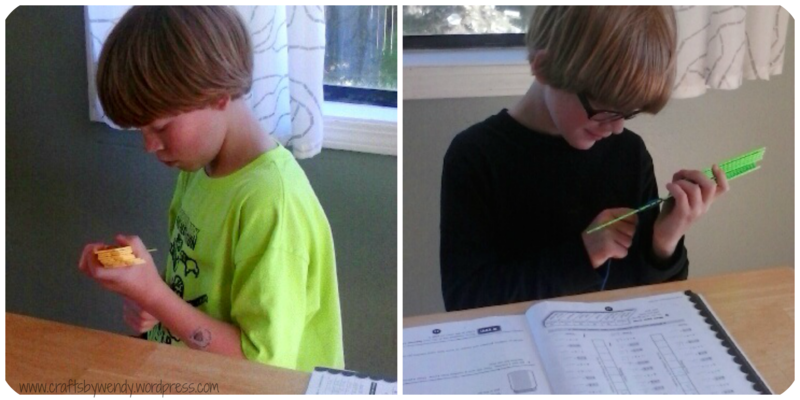 To supplement the Learning Wrap ups, we received the addition and multiplication mastery workbooks. These included such exercises as “rapid writing” and “math family fun pages.” They worked very nicely with Wrap ups. Seahawk used the Multiplication Mastery, and Munchkin used Addition Mastery during the review period. I fully intend to purchase one more copy of each (individually, the workbooks are only $4.99 each and are consumable, so you need to buy one per student) and have them switch for further mastery this summer. We haven’t done a whole lot with the Vocabulary Wrap ups yet (at least not formally – they’ve still gotten lots of use! ), but as we continue to study various types of words, they will be great tools. They work exactly the same way as their math counterparts, but you’re matching words instead of numbers. The Learning Palettes are really cool, too. The basic design is that of a painter’s palette, but instead of paints all around the edge, there are spaces for colored discs. You place a question card in the center of the palette, which has 12 problems to solve. Each problem is assigned a colored disc – there are six colors, and each one has a solid disc and one with a hole. There are a variety of answers along the outside of the card, and the task is simple: place the disc from the question into the spot with the correct answer. Like the Wrap ups, the Learning Palette is self-correcting; after the discs are placed, the card is turned over and the answers are revealed. The method is the same regardless of the grade level you’re using. The highest grade level for the Reading Learning Palette is 3rd, so it was primarily used by Munchkin during our review period; we did get 4th grade math, though, which Seahawk used. The Learning Palette Kits each come with lots of curriculum cards (which are also available separately in both math and reading). The 4th Grade Math kit comes with 6 packs of curriculum cards, and the 3rd Grade Reading comes with 5 packs. Each pack has 12 cards, and each card has 12 questions. For those of you who aren’t so into math, that adds up to (well, multiplies to) 720 questions in the reading category and 864 in math. Talk about a lot of information! The pros are clear and strong. First of all, the programs are fun for kids. Way more fun than flash cards. And when kids are having fun, they learn more. My boys absolutely loved the Wrap ups, and guess what? They’ve very nearly got their multiplication tables memorized, and they only rarely have to use their fingers for adding anymore. That makes me one happy mama! It’s taken us a bit longer than the 10 Days advertised, but you know what? I don’t mind. At least we’re finally making progress, which is way more than I could say two months ago. They really enjoy the Learning Palettes, too. They don’t like them quite as well as the Wrap ups, but I think that’s just because they’re bigger and more cumbersome than the hand-held Wrap up. The main con with this program is that things are never mixed up; the Wrap up is the same every time. I don’t think that hurts the kids’ ability to master the facts in the short term, though. I’m confident that my boys were learning the facts, not the string pattern. Seeing the facts in a different order than they were on the Wrap up did slow them down a little bit, but not too much. And this is where the combination of the Wrap up and the Mastery workbook are necessary. The workbook (almost) completely counteracts the con of the sameness of the Wrap up. While the two products (Wrap ups and Palettes) are quite different, the pros and cons are the same for both. The Palettes are super fun – even Small Fry loved playing with them! (They kept him occupied quite nicely while we were working on other lessons.) The questions don’t change, but there are enough of them that it probably doesn’t matter. By the time your child has worked all the way through the cards, the “old” ones will feel fresh again. Would I recommend this product? In a heartbeat. In fact, I’ve already done so several times. I also plan to buy some of the lower level Wrap ups for my nieces and nephews as they start hitting their “school age” birthdays this year and next – that’s how much I believe in this product. It worked wonders in my boys, and I’m telling anyone who will listen about them!